In 2004, funnyman Will Ferrell introduced the world to Ron Burgundy, the inappropriate goofball of a news anchor in the beloved comedy Anchorman: The Legend of Ron Burgundy. The mustachioed moron was so popular with audiences that they almost instantly started begging for a second helping of Mr. Burgundy’s antics. After almost ten years of waiting, fans finally have their follow-up. Truth be told, I was never a big fan of the scotch-swilling Mr. Burgundy and his equally obnoxious Channel 4 crew members, even though I tried so hard to see what everyone thought was so funny about them. They spouted off random and inconsistent jokes that never seemed to rise above mild chuckles, yet everyone roared on with delight and stared at me like I slapped an infant when I said I wasn’t a very big fan of Anchorman. Now we have director Adam McKay’s Anchorman 2: The Legend Continues, and I’m sad to report that this crew of comedians couldn’t win me over on their second round. In addition to just not being very funny, Anchorman 2 is a dull and, frankly, boring comedy that simply recycles a large chunks of the worn-out jokes that were used the first time around. Anchorman 2 picks up in the early 80s, with news anchor Ron Burgundy (played by Ferrell) and his wife, Veronica Corningstone (played by Christina Applegate), staring a promotion in the eye. It turns out that their boss and idol, Mack Tannen (played by Harrison Ford), is stepping down from his position as a nightly news anchor, leaving the position open to Ron and Veronica. After a tense meeting with Tannen, the job is offered to Veronica, which makes her the first woman to host a nightly news program. In a surprise move, Tannen decides to fire Ron for years of imbecilic behavior on the air, leaving the cocky newsman distraught and humiliated. Things get worse for Ron after he storms out on his marriage and ends up hosting a show at Sea World. After loosing his job at Sea World, Ron is approached by Freddie Sharp (played by Dylan Baker), who works for an up-and-coming 24-hour news network run by Kench Allenby (played by Josh Lawson) and Linda Jackson (played by Meagan Good). Ron accepts the offer under the condition that he can reunite his former news team, which consisted of Brian Fantana (played by Paul Rudd), Champ Kind (played by David Koechner), and Brick Tamland (played by Steve Carell). Everything seems to be going great for the reunited team, but after several run-ins with rival news anchor Jack Lime (played by James Marsden), the group begins waging a ratings war at their new network. In an attempt to be number one, Ron makes a bold choice to report on what people want to hear rather than what they need to hear, changing the course of news history. While a good majority of the jokes in Anchorman 2 are met with crickets from the audience, the film still manages to cleverly poke fun at a long list of news stations including CNN, NBC, Fox News, and HLN, to name a few. There is something realistically amusing about watching Mr. Burgundy as he incorrectly speculates about a wild car chase, smokes crack on the air, reports on puff pieces, and shouts over a slew of guests battling to have their opinions heard. It’s all undeniably clever and it marks the few places where Anchorman 2 actually finds some momentum, but once McKay drifts away from the newsroom shenanigans, the film succumbs to juvenile silliness that bores more than it amuses. When Ron isn’t busy erupting in disbelief over the fact that one of his new bosses is black, there are bizarre screaming fits and staring contests between Carell’s Brick and his new crush, Chani (played by Kristen Wiig). There is the expected clueless racism and “WHAMMY” explosions from Champ Kind, who has also opened a new chicken restaurant that serves up breaded bats to its patrons. The only one who really gets a few good cracks in is Rudd, who seems to be able to sell any material he is given, even when he delivered the same jokes the first time around. There’s no doubt that the guys enjoy playing these characters and they are eating up the opportunity to ad-lib their way through the performances, but you’re left feeling like a group of talented comedians like this could have come up with better jokes, ones that could split your sides. 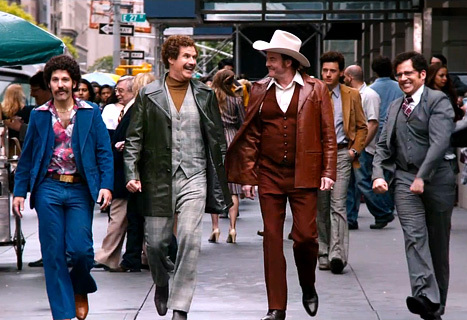 As far as the supporting roles and cameos go, Anchorman 2 finds plenty of funny men and women stepping in front of the camera to drive up the hilarity level. While there are too many to name here and some are best left a surprise, there are still some that play key roles within the film. Wiig’s Chani is basically a female version of Brick, a knuckleheaded dweeb that meets Carell’s string of nonsense with her own brand of offbeat comments. 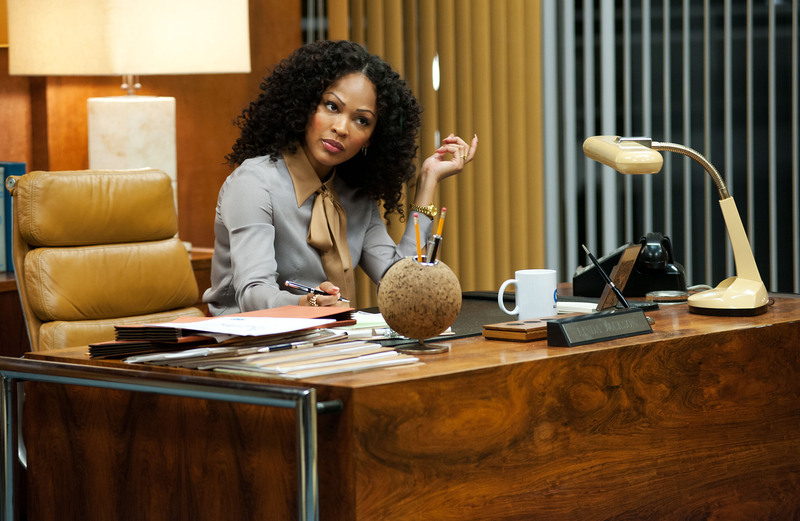 Meagan Good is fairly dull as Linda Jackson, Ron’s sassy African American boss who finds herself attracted to the scotch-and-flute loving news anchor. Applegate’s Veronica Corningstone remains largely the same, there to be exasperated with Ron’s belligerent behavior. Dylan Baker’s Freddie Sharp basically just grins from behind a pair of sunglasses and acts as the glue that holds Ron and his team together. Marsden is having a good time as Jack Lime, the rival news anchor that never misses a chance to rip Ron apart. Rounding out the main cast is Harrison Ford, who scowls in true Ford fashion through his role of Mack Tanen. Overall, while it does an excellent job spoofing 24-hour television news stations, Anchorman 2: The Legend Continues still manages to feel like it’s on cruise control (much like Ron’s tumbling Winnebago). It looks like the cast had a great time throwing on the period clothing and hanging out with each other, but you know you have a problem when you’re marketing campaign ends up being funnier than your scattershot film. Posted on January 5, 2014, in REViEW and tagged 2013, adam mckay, christina applegate, comedy, david koechner, dylan baker, harrison ford, kristen wiig, paul rudd, steve carell, will ferrell. Bookmark the permalink. Leave a comment.